The question is not “is climate change happening?” The question is, “what are we going to do about it?” Some people continue to deny it, others choose to look the other way and hope it will go away, and another group only want to take action if it doesn’t interfere with economic growth. In his book Tipping Point, Malcolm Gladwell described a similar scenario. It was the early 1400s and the world was getting colder, not warmer. In Greenland there were two populations – the Vikings and the Inuit. As temperatures dropped, the Inuit were OK, because their staple was fish. The Vikings liked their meat, so when grass growth slowed down, they first ate their mature animals, then the young, and then their dogs. Archeological evidence reveals that the population crashed – and it happened rapidly. The lesson for us is our adaptive capacity. The Drawdown project as described in this post, identifies reductions of 1,051 gigaton of CO2 that can be achieved by its top 80 solutions. 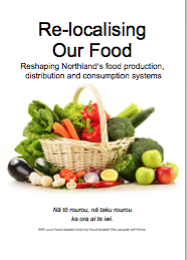 Food solutions account for 31% of these reductions – 325 gigatons. Number 14 on the list are tropical fruit crops (including bananas), accounting for a reduction of 20.19 gigatons of CO2 globally, over 30 years. New Zealander’s consume about $18 kgs of bananas a year, mostly all imported. If we can grow our own bananas, we would need about 7,700 hectares of bananas to meet our own needs. Northland is great place to grow bananas. We are at the warm end of the temperate zone, but as we are a long skinny peninsula surrounded but the Pacific Ocean and Tasman Sea, our climate is benign enough for some tropical crops, especially those from higher tropical altitudes. So can we adapt or are we the 21st Century Vikings? One thing we could do, is to plant and eat more bananas (grown as a perennial crop), and eat less white bread (using wheat derived from an annual crop). Here are some comparisons. In another lesson from history, The people of England were collectively traumatised by the First World War and didn’t want to be involved in another. They tried to ignore the threat that Adolf Hitler posed in a “fog of denial”. But Winston Churchill persisted in raising the alarm. Bananas are part of our Northland climate change solution, so to paraphrase Sir Winston, … we shall plant them near the beaches, we shall plant them in the school grounds, we shall plant them in the fields and in the streets, we shall plant them in the hills; we shall never surrender. The Drawdown project has raised my optimism about climate change. There are plenty of doomsayers who think that we are stuffed. For a whole lot of people, its a problem that is just too big to handle, so the strategy is to ignore it. In New Zealand our government tells us that we are too small to make much impact and they appear to believe, action on climate change and improving the economy are mutually exclusive. Centuries ago Europeans had some limiting perceptions that inhibited world travel. Some pre-Columbus maps marked the possible presence of dragons, and there was always the prospect of falling of the edge of a flat earth. Now we have got better knowledge and GPS! Our collective perception of climate change is like those centuries old perceptions of the world. Climate change is scarier than dragons, so for most people it seems it is better not to go there – and just hope its not true. Drawdown has changed all that. As most of us accepted, climate change is the result of an increase in greenhouse gasses but the Drawdown team have quantified targeted reductions of CO2 that will get us to the point where we start to reduce atmospheric concentrations. They have also quantified the top 80 solutions and calculated the CO2 reductions in gigatons. We now have a map and GPS! They acknowledge that the System is dynamic, so exact calculations are problematic. However most of the calculations are based on trends that are already happening. So we can move beyond our collective paralysis and choose the solutions that work best in our lives? Here is a link to Drawdown’s Solutions webpage. Mother Teresa told us “Not all of us can do great things. But we can do small things with great love”. I love this planet and its more than gravity that makes me attached to it. When it comes to climate change, I can’t do great things, but I can do small things with great love. Not just for the planet, but for all of my descendants, and all those who will suffer as a consequence of climate change. And what encourages me more is the actions I can take to reduce CO2 in my world also have other positive benefits. Here are some solutions I can work on. Drawdown calculates the a 70.5 reduction in gigatons of CO2 over 30 years if we collectively waste less food. I can reduce waste by growing my own food – that cuts out the waste in the supply chain. I grow my own bananas, so I am not contributing to the waste produced when those bananas that are either too long or too short are discarded. I can also monitor what goes out into the compost. Working my own land and composting returns food waste to the land and increases the organic matter (carbon) in the soil. I only have a little bit of land, but it all helps. I’m reducing my meat intake. Meat takes a whole lot more resources than fruit and vegetables. According to Drawdown this will reduce CO2 by 66 gigatons in 30 years. We can also expect a health dividend from reducing meat intake. I want to by an electric vehicle (no. 26) but I have never spent more than $10,000 on a car. But I can get an electric bike. If I do, I will be contributing to the 0.96 of a gigaton in CO2 reductions over 30 years. Not a lot, but every bit helps. And if I keep riding my non-electric bike the result will be better still. So there are just three of the 80 solutions that I can contribute to. How about you?